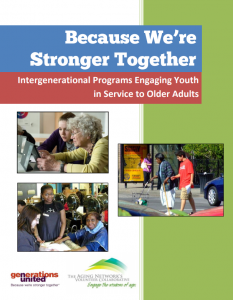 This guide provides an overview of intergenerational youth service programs, tips of success, and a variety of program examples. The United States is in the midst of a demographic transformation with both youth and older adults making up an increasing proportion of the population. Currently, there are approximately 41 million people in America who are 65 years and older, an increase of 6.3million or 18 percent since 2000. By 2030, there will be more than 72 million people over the age of 65. At the same time, there were approximately 74 million children in the United States, an increase of 1.7 million since 2000. This number is projected to increase to 80 million in 2030 The most recent statistics show that there are about 25 million children between ages 12 to 17. Additionally, the gap between the percentage of older adults and children has narrowed. By 2040 each group will constitute approximately 20 percent of the total population. In other words, older adults and children will make up over 40 percent of the U.S. population. This shift is only one part of current demographic, social, and economic changes. In 2012, 47 percent of children (ages 0 to 17) in the United States were nonwhite or Hispanic. By 2050, this number is projected to be closer to 64 percent. Similarly, older minorities are increasing as a proportion of the older population. Where this new reality is seen by some as a challenge, it also presents unique opportunities for intergenerational collaboration. Intergenerational programs by definition increasecooperation, interaction, and exchange between people of different generations, allowing the sharing of talents and resources, and the supporting of each other in relationships that benefit both the individuals and their community. Within this framework, young people can and do provide an array of helpful services to older people. These programs range from mentoring to friendly visiting, chore services to computer classes, and gardening to gaming. Youth volunteer at very high levels. The most recent data show that 27.4 percent of teens (ages 16 to 19) and 18.9 percent of youth adults (ages 20 to 24) volunteered in 2012. If younger teens are taken into account, as in the 2005 Youth Volunteering and Civic Engagement Survey, over 55 percent or 15.5 million teens between the ages of 12 to 18 volunteered.